Leveraging the expertise of its European Design Studio in Leicester, UK, CROWN Bevcan Europe and Middle East, a business unit of Crown Holdings Inc., has helped long-­standing customer Lipton make its mark with consumers with an engaging new package. The application marks the first time this technology has been used as an integral and central part of a design. Leveraging the expertise of its European Design Studio in Leicester, UK, CROWN Bevcan Europe and Middle East, a business unit of Crown Holdings Inc., has helped long-standing customer Lipton make its mark with consumers with an engaging new package. 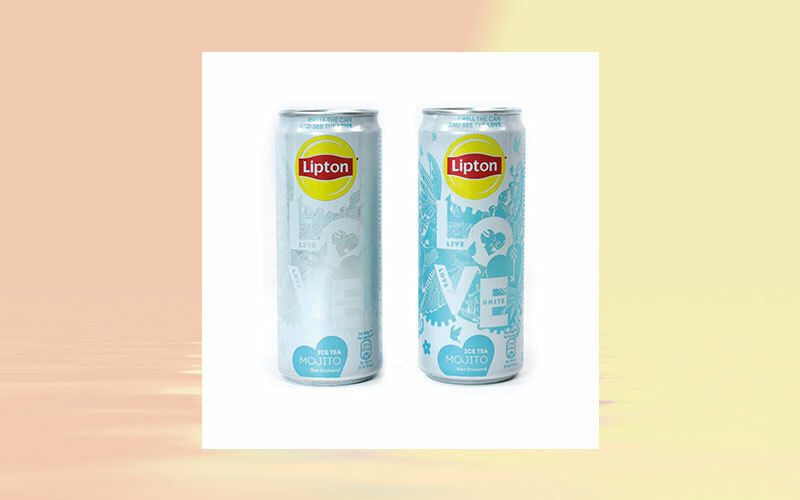 The iconic tea brand’s partnership with Tomorrowland, a Belgian music festival promoting life, love and unity, inspired the design for Lipton® Iced Tea, which incorporates thermochromic inks that enable the can to be ‘brought to life’ by consumers through direct interaction. The application marks the first time this technology has been used as an integral and central part of a design. The end result is a beverage can that essentially has two faces – before and after cooling – to create a fresh marketing and decorative tool that enhances both the branding and the “love” theme. A strapline encouraging consumers to ‘chill the can and see the love’ is prominently featured – offering a nod to the improved enjoyment they can experience with the cold beverage. It is also a literal statement, since the word ‘love’ appears once the can has reached optimal temperature for consumption. Crown’s reprographics team, recognized globally for its talent with decorative finishes, worked with Lipton’s design agencies to maximize the impact of the inks. Proofing sessions were carried out extensively to color match the blues required to achieve the end result and the final product was universally applauded by all involved. Thanks to this innovative Tomorrowland design, Lipton® Iced Tea has succeeded in interacting with consumers using engaging visual communications and pioneering decoration techniques. HEUFT anniversary: striving forwards for 40 years!